Definition: Bonds can be defined as the negotiable instrument, issued in relation to borrowing arrangement, that indicates indebtedness. It is an unsecured debt instrument, in which the bond investor extends credit to the issuer, which in turn commits to repay the loan amount on the specified maturity date, along with interest throughout the life of the bond. The issuer can be the municipal corporation, government or company. Government Bond: At periodic intervals, the central or state government issues bond, popularly known as government securities (G-secs) or gilt edged securities. These are issued by the central bank of the country on behalf of the Government, for medium to long term, on which interest is paid on half yearly basis. 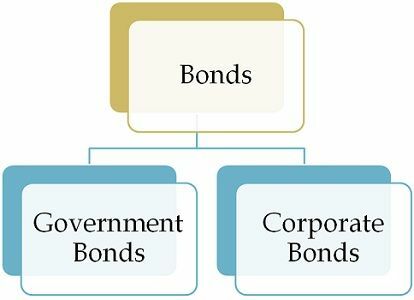 Corporate Bond: When public companies issues bonds, they are known as a corporate bond. When it comes to international market, a secured corporate debt instrument is known as a corporate bond, but in the case of the unsecured debt instrument, it is known as a corporate debenture. In India, corporate debt instruments are termed as debentures. Bonds issued by the government are considered as risk-free while those issued by the corporates are exposed to risk. Par value refers to the value stated on the face of the bond, which shows the amount which the company or government body promises to pay at the time of maturity. Coupon Rate is nothing but the fixed rate of interest payable to the bondholder. Maturity Date is the date at which the bond gets matured, and the principal amount is paid to the bondholder. Redemption Value is the value paid to the bondholder, at the time of expiry of the term for which bond is issued. A bond indenture is a contract document between the issuing body and the bondholder, that specifies the factors discussed above. Fixed Rate Bond: Otherwise known as straight bonds, they carry a specified coupon which remains constant throughout its life. Floating Rate Bond: Floating rate bonds are one, on which the interest rate is not specified, and it fluctuates as per market conditions. Zero Coupon Bond: The bonds which do not carry periodic interest payment is called zero coupon bond. The issuance of these bonds are made at a steep discount over its face value and repaid at face value on maturity. Deep discount bond: A type of zero interest bonds which are offered for sale at discounted value and is redeemed at face value on its maturity. Convertible Bond: Bonds that gives the holder the right to convert them into equity at a fixed conversion price are called convertible bonds. Bearer Bond: A negotiable certificate issued to the holder without recording the name, is called bearer bonds. Option bond: It encompasses those cumulative and non-cumulative bonds in which interest is payable on regular intervals or at maturity. Further, redemption premium is offered to draw the attention of investors. Inflation bond: The bonds in which coupon is adjusted for inflation, so as to ensure that the return is provided to the investor, which is free from the effect of inflation. To sum up, bonds are an ‘I owe you’ instrument issued by the borrower. The bond value is equal to the present value of the cash flows expected from it.